by Nancy Rue and Stephen Arterburn. Even though Healing Waters offers some discussion questions (in the back of the book), I find it helpful to create my own…as a reminder of issues I think the book club might want to discuss. It also helps me remember important passages or events in a book as I read it. I purposely don’t read the author provided questions until I’m finished with a book, but I do record my own as I move through the text…so there may be some duplications here. Did you feel the novel was authentic; that is, did the cast of characters appear realistic? Were the events, problems, conflicts, and internal dialog believable? Lucia has to “steel” herself before seeing Sonia after the accident. Do you believe there are events and situations that as Lucia says “once I saw it, there would be no erasing it. No matter how hard those people prayed”? What do you do when you’ve witnessed a horrific or extremely unsettling situation? Are you comfortable with public prayer (Christians standing in a circle, holding hands, publicly praying) or are you more likely to offer a private prayer like Lucia? Why? Is the way in which you pray an indicator of your faith or believe? Porphyria Ghent tells Sully “Only someone who has been through hell can help someone else find their way through the smoke, Sullivan. You don’t have to be a doctor to do that.” Do you agree? If so, how can a young minister, psychiatrist, psychologist, nurse, teacher (fill-in-the-blank) professional, fresh out of college ever hope to effectively help without more life experiences? Do you believe that healing is a sign of faith? If so, why do faithful, believing, strong Christian people suffer? If not, then what is the meaning of Mathew 7:7 (“Ask, and it will be given to you. Search, and you will find. Knock, and the door will be opened to you.”)? Almost halfway through the book, Sully records a podcast and asks “how can we reconcile the stinking, groaning, biting fact of human suffering with the undeniable existence of a God who loves us?” How would you answer that question? Wesley, the physical therapist, seems to believe that miracles do happen but also says ” I don’t work with patients who sit around waiting because they think God would never let them down.” What do you think she means? At one point, Sully says that parts of Sonia’s belief system are “toxic.” What does he mean and which parts? Do you believe that “every tragedy that befalls us is either God’s wrath or an opportunity for a miracle?” Explain your thinking. Do you believe that (as Lucia confesses), “I do believe…that He (God) loves some of us more than others….that [fill in the name of a person] is one of those God loves more deeply than other people.” Depending on your response, share your concept of “a chosen people,” “God’s people” and Christians versus members of other faith communities. Was the staff of Abundant Living Ministries fairly portrayed by the author through the eyes of Lucia? Or do you think they were just a caricature (created by the author) of devoted Christians? What was/is Lucia’s “problem?” If Lucia were a “real” person, do you think a psychologist could help her? Or does she just need more faith and belief? Lucia hears her Mother’s voice in her head. Do you hear you parents’ voices and admonitions? If so are the voices a good thing, bad thing or of no consequence? What messages do you remember from your parents? What messages do you think you give as a parent? Does God know suffering? What do you think is the purpose of pain and suffering in life…or is there no purpose? Were you happy, disappointed or didn’t really care about the ending? 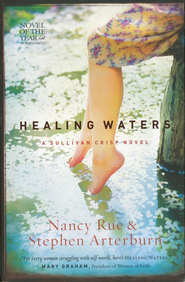 Please join us on Thursday, May 9, 2013 at 7:00 PM for the All Good Books group discussion (at the Leawood Pioneer Library) of “Healing Waters” by Nancy Rue and Stephen Arterburn.